We’ve talked a lot about Diaspora, the open-source Facebook-alternative, in recent months. One of the reasons for that is the massive success they had raising money on the crowdsourced fund-raising site, Kickstarter. The project raised over $200,000 from nearly 6,500 backers in just 39 days. 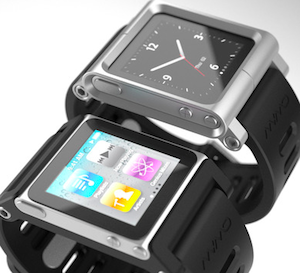 Now a new project has already blown that tally out of the water: an iPod nano-based multi-touch wristwatch. Scott Wilson, the founder of Chicago-based product and design studio, MINIMAL, set out with an idea: to create two watch enclosures for Apple’s latest iPod nano. He wanted the TikTok to be a low-end model ($35) and the LunaTik to be high-end ($70). So he put his project on Kickstarter with a goal of raising $15,000. So how is he doing? Well, he’s raised $341,895. And he still has 22 days to go. Wilson’s project has not only blown past the high-profile Diaspora one, it’s poised to demolish the all-time funding leader, the Save Blue Like Jazz movie. That project raised $345,992 when it closed on October 25. Wilson’s project should pass it tomorrow, if not tonight after I publish this post. And with good reason. While the idea is a simple one (Apple CEO Steve Jobs even joked about such an idea on stage to highlight how small the nano is), but it’s something a lot of people clearly want. The project has 4,636 backers so far. And the video Wilson made to accompany the project (below) looks quite a bit like an Apple-produced video. Again, the project still has 22 days to go on its funding run. I have to imagine it’s going to shoot well past $500,000, putting it far atop the Kickstarter Hall of Fame.